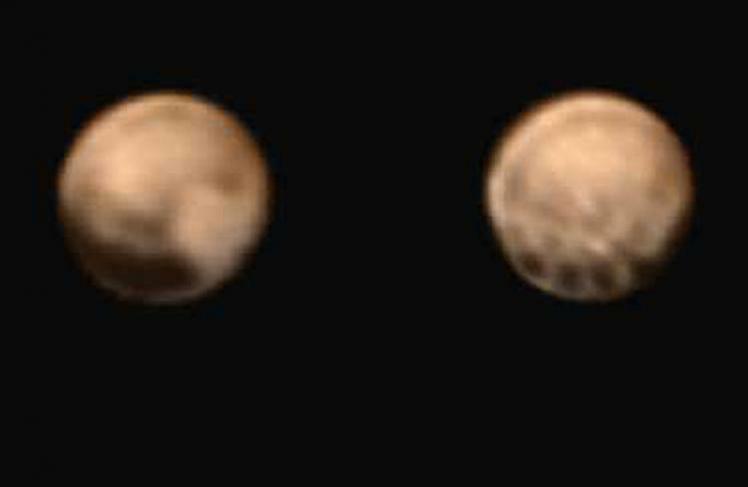 A NASA probe sent back mystifying images of the surface of dwarf planet pluto – then the signal cut out. The probe sent back a strange image of a ‘dotted line’ on the surface of the planet, which scientists admit is a ‘real puzzle’. The craft’s main computer malfunctioned hours later, and scientists are now working to revive the craft. The probe is powered by a Star Trek-style ion drive – and has ‘slept’ for nine years on its journey to Pluto. Over the next few months, New Horizons is set to unlock the secrets of Pluto, a distant, icy world which has never been seen except as a distant dot in our telescopes. ‘It’s a real puzzle – we don’t know what the spots are, and we can’t wait to find out,’ said New Horizons principal investigator Alan Stern. On Saturday, an unknown glitch caused New Horizons to switch to a backup computer, which triggered an 81-minute break in radio communications with mission controllers at the Johns Hopkins University Applied Physics Laboratory in Laurel, Maryland, NASA said in a status report. The work is complicated by the 4-1/2 hours it takes to send a set of signals to the spacecraft, which is nearly 3 billion miles from Earth.